“Bluetooth earbuds?”, you ask. Yes. And for someone like me who never goes anywhere without an Audible audiobook in his ear, they are a Godsend. Over the years I have gone through many, many pairs of earbuds. I kept my MP3 player in a vest pocket or (recently) in a holster on my hip. That left a cord running from my ear down the left side of my body. That damned cord had a magnetic attraction to door handles, bike handlebars, fence posts, furniture, pets, passing dragonflies, etc. Life gets especially exciting when the cord wraps itself around a steering wheel while you are in heavy traffic. How we suffer for our art. Every time something yanks earbuds from your ear, which is painful and worse, makes you lose your place in your audiobook, it weakens the internal wire connections. I generally got Skullcandies for about $20, which had good sound and were more durable than most. But even treating them gently I could only get 3 months or so out of them. Last Xmas my wife got me Bluetooth earbuds, the Jaybird JF3 Freedom. So yes, these guys have been around for a year or so already, but people still stop to ask me about them. I’ve only used them with an iPhone, but they are supposed to work with any A2DP Bluetooth device, which includes Blackberries, Droids, etc.. 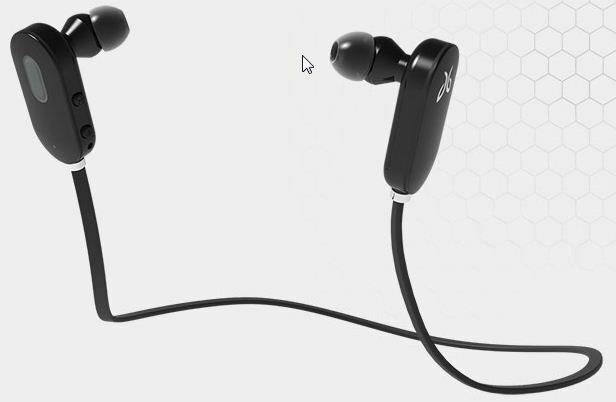 Looking at the picture above, you can see a pinky-sized grey button on the right earbud body. That acts as a play/pause button for whatever music player (or the Audible app) you have going. It also answers the phone but the built in mic is crappy so I don’t use the earbuds for phone calls. The same button is also how you power on the unit, which is my biggest problem with the thing: you have to hold it down for 7 seconds (why??) to power it on. At 8 seconds, it starts the pairing operation. I have lost count of how many times I started pairing when I only wanted to power it on. To stop pairing, you have to power it off, which takes 4 seconds. Then you power it back on, another 7 seconds. Damn it, one second too long, it started pairing again. Power it off, 4 seconds. Power it back on. Et cetera. Also on the right earbud body, there are two tiny grey buttons that act as volume up and down. They are nice but don’t have much range — I usually have to control volume at my iPhone. Then there is a micro-USB jack for charging. I read someplace that the right earbud body also contains the Bluetooth antenna. However, these things usually use the cord as an antenna (it’s a long wire, after all). Through trial and error, and experiments using tin foil wrapping, I’ve found the right side does get slightly better reception than the left. I guess there are some antenna bits in there. This leads to my second problem with the thing, and what the company itself warns you about. Apparently the Bluetooth signal needs stuff to bounce off to get from your MP3 player to your earbuds. This is a problem when you are outside. That’s where I do all my running. Inside, the earbuds can talk to my iPhone across the room. Outside, my hip is pretty much the extent of their range. I keep my iPhone in a holster on my left hip. Normally this is fine. However, when I’m running or cycling it sometimes cuts out. I could get an armband holster, I suppose, but I don’t like them. Switching to the right hip helps a little, maybe. The kit comes with a sturdy case, which is kind of useless unless you plan to carry the case around. It also comes with three sizes of eartips, and three sizes of this hook shaped rubber mesh thing that fits in your ear to lock the buds in place. With that getup I’ve never lost an earbud. As for the cord, so far it has never caught on anything. I wear it in front of my neck most of the time, where I barely notice its light touch. When I’m at the gym, I string it behind my neck just to be safe, but it tends to stick to my skin back there. Battery life is good, 4 hours I’d guess. This leads to my third problem with these earbuds: you don’t get much warning when the battery is about to die, and there is no visual indication. You get a few minutes of annoying beeps, then silence. The weakest link in earbuds is where the cord connects to the buds. Jaybird has reinforced this point with a thick metal collar. After eight months of daily use, they are still going strong. I would have replaced my Skullcandies four times by now. If you look at it that way, the steep $100 price for these things is not such a bad deal. Overall I’m very pleased with these things. They are useless for phone calls, worse in fact than regular earbuds because you get that crappy mic whether you want it or not. They have good high and low frequency response, as earbuds go. For music and audiobooks, they are my best earbuds yet. Postscript: I see Jaybird just released a new model, the JF4 Sprint. It’s a little smaller but the battery life is also a little shorter. Does anyone have experience with these? Does it fix my 3 problems? I’ve been an Audible subscriber for 9 years, although I bought my first audiobook from Audible even before that. For a double sawbuck each month I get two books of any length — an incredible deal. Plus all the books have reviews by real listeners. Yeah that’s standard stuff now, but back then it was pretty cool. It’s the best way to decide your next read. The Audible format plays all on the major MP3 players. I always have an MP3 player with me, and so I can grab a few minutes of my book anywhere: exercising, driving to work, mowing the lawn, standing in lines, sitting on the throne. Sometimes it’s hard to keep up with my two books per month. If I get behind, I buy shorter books until I get caught up. The voice performances are usually terrific, and lately we’ve been hearing big-name actors like Tim Curry and Whoopi Goldberg. An aside to any narrators who may be reading this: some of you are great with voices, making a unique voice for every character, and some aren’t. If you aren’t good with voices, don’t bother. You can still be a great narrator without them. A pleasant and clear voice is far more important. You will certainly lose readers if you do voices poorly. Anyway, I guess my Audible plan is $23 per month now, but I got grandfathered in for the original $20. Still an incredible deal, considering one audiobook from the bookstore is twice that, or more. Plus they are CDs. Pfft. Old technology. I’ve had various MP3 players over the years. I resisted becoming an iSheep for as long as possible, but a couple of years ago I decided to claw back some pocket space. I retired my Zen MP3 player and Nokia cell phone and got an iPhone. iPhone and iOS are a great piece of kit, but I HATE iTunes… a subject for a future rant. I used the built in Apple Music player for years until I found Audible had an app. When did that happen? The Audible app is so much better than Apple’s built in Music app. It has some handy features such as speedup/down, sleep timer, and bookmarking. It even integrates with Bluetooth headsets so if you tap your play button it will resume where you left off, just like with the Music app. FYI the Bluetooth button trick works with the Music app too. So how, you are about to ask, does iOS know which app to use when you tap your play button? Audible or Music? It seems to go by the one you used most recently. Or sometimes it gets confused and does Music. Another nice thing about the Audible app — you can download audiobooks without connecting to your computer! It will come in over wifi. Not 3G or 4G though, it times out (too big). All is not rosy, though. I’ve been using the app for a couple of months now, and I did run into a couple of annoying problems. Well actually, it was the same annoying problem twice. I lost all my downloaded books and had to re-download them. Once was when Audible “encouraged” me to merge my Audible account with my Amazon account. The second time was after an app upgrade. Both times I was near wifi and was able to re-download without too much trouble. At least, I hope those events were what caused it. Maybe it was coincidence and it could happen at any time. What if I have no wifi? I would be without an audiobook! The Horror! Anyone else have problems with the Audible app? Just got back from a week at Universal Studios, and I must say Orlando drivers are creative. For example, the first evening we were there I stopped at a red light at a T-intersection. This was after a day at the theme park. You know what I mean — 60 minute lines for 2 minute rides in 95 degree heat and everyone with 0 patience after the first 30 minutes. Anyway, there were four lanes on my side of the street: the two left lanes had to turn left, and the two right lanes had to go straight. I was in lane two, going straight, and at the head of the line. The two left lanes got a green advance arrow and started moving. A moment later, a lady in a dark blue SUV pulled up next to me on my right. She motioned that she wanted to cut in front of me. I shrugged and motioned “sure”, assuming that she wanted to cut in front of me after the light turned green. Nope, that wasn’t what she had in mind. While the light was red, she drove forward into the intersection, slashed in front of me, and attempted to barge into the rightmost turning lane. It was full, so she had to wait until the green arrow was past red before she could make the turn. At that point my light turned green, but since she was stuck in the intersection and blocking my lane, I had to wait for her before I could move. Most interesting to me was how no one cared. 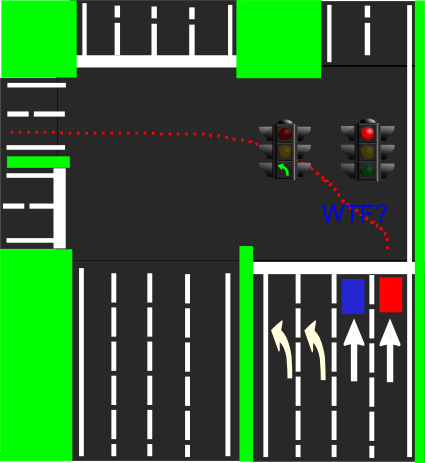 The next day, I was stopped at a different red light at another major intersection. Ahead of me, some guy in a beat up compact sedan decided he had enough of waiting and cut across the median to make a U-turn. The median was a grassy depression about 30 paces across. So he went out, down, over, up, and then peeled out in the other direction. It took a dozen seconds and was in plain sight of everyone in both directions. And this was only the first and second day we were there. There were other stunts as impressive as these but I, like the locals, no longer cared. When in Rome? Continuing my rant from earlier this week, let’s look at decimate. It was originally used to describe a punishment inflicted on cowardly or mutinous Roman legions. Every tenth soldier would be killed, as chosen by lot. Hence the root deci- for “tenth”. Think of a decimeter (or decimetre for all you Brits and Canucks) which is one tenth of a meter (or metre for all you Brits and Canucks). So decimate means “reduce by a tenth”. Yet somehow, decimate has come to mean “reduce to a tenth”. Or as used by the news media, “any number big enough to grab your attention that we can’t actually define”. In fact, check out the Webster definition for decimate. It starts out with the correct definition then devolves to the wrong one. Here’s a fun one: awful. It can mean really bad, or really good. I’m serious. The original definition was “full of awe” — this makes sense. But now it means the opposite, which makes no sense. Instead of fixing the problem, our English ancestors invented a new word to fill the gap: awesome. So far awesome has kept its original meaning, but its overuse in modern vernacular is awful. Same thing with LUN. Time to go all techie on you, so non-IT people can change the channel. Or maybe not, you can probably follow this and still find it amusing. In the IT world, we use a lot of virtual disk drives. They are commonly called Logical Units, since they are real drives grouped logically to form a virtual drive. The main advantage is if one of the real drives crashes and burns, other drives can take over and you don’t lose any data. Well, we need some easy way to identify this virtual drive, so we give it a number, because computers like numbers. We call it a Logical Unit Number, or LUN. Thus a LUN is a number that identifies a Logical Unit. Well, everyone in the IT world (except me) refers to the drive itself as a “LUN”. It’s like calling your house an “address”. The address is how people find your house, it’s not the house itself. In fact, when my colleagues want to know the number that identifies the virtual drive, they ask “what is the LUN number?” Yep, it’s “PIN number” all over again. Sigh. You and I are the only sane ones here. And I’m not so sure about you.